A Ghostbusters ride, live show and diner will be located within the Sony Pictures zone at the theme park. The Motiongate Dubai theme park is welcoming a raft of Ghostbusters attraction from October. A Ghostbusters live show will turn the team into a live dancing boy band as they try to capture Dr. Janosz Poha who is possessed by the evil Prince Vigo of Carpathia. Elsewhere, the Ghostbusters: Battle For New York ride will see visitors join the team in an interactive journey to the Temple of Gozer where they will join a rooftop battle and save the city via a series of shooting game. The Ghostbusters area, located within the park’s Sony Pictures zone, will also boast a Slimer’s Diner where visitors can grab some Ghostbusters-themed food and drink, including Slimer’s Slush. 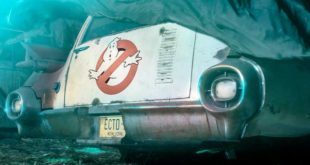 “Ghostbusters is a classic film that has transpired generations over the past 30 years, and Motiongate Dubai is finally giving the world the chance for guests to immerse themselves into the film through a world-class Ghostbusters ride, the Ghostbusters live street show and a themed diner," said Stanford Pinto, chief parks operating officer for Dubai Parks and Resorts. "Guaranteed to be crowd pleasers, we can’t wait to introduce our action-packed Ghostbusters theme park experiences to the world." Other attractions within the Sony Pictures zone includes rides based on Cloudy with a Chance of Meatballs, Underworld, Zombieland and Hotel Translyvania. Other zones at Motiongate Dubai include the Smurf’s Village, DreamWorks and Lionsgate.